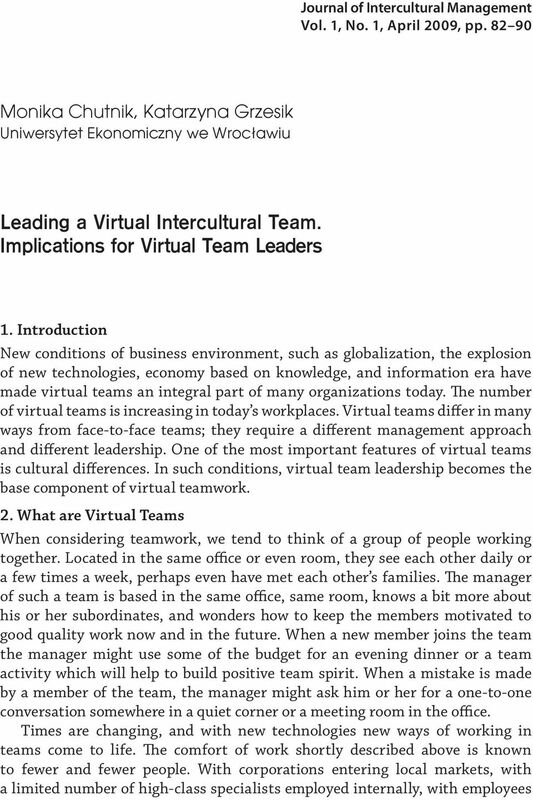 Download "Leading a Virtual Intercultural Team. Implications for Virtual Team Leaders"
3 84 origin. Also the expected way of running business will differ. This creates a great potential for misunderstandings and tension in the team. Due to this risk, team members need to demonstrate a certain degree of intercultural sensitivity or must be able to develop it with the guidance from other team members and the team manager. The role of a virtual team manager is only partly similar to the role of a manager of a collocated team. The close, everyday contact, which is normally possible in collocated teams, takes a different form in a virtual setting. It would be possible to be in daily touch with virtual team members but the effort to do so would be just too big, especially when different time zones come into question. Therefore, team members need to be much more autonomous than in a collocated setting. In a prevailing number of cases the only reasonable option is to trust the team members to do their tasks competently and independently and be more support than control for them. Let us see in more detail here how to manage, support and improve cooperation in teams which are globally scattered and culturally diverse. 3. Leadership Challenges in Virtual Teams Leading all teams, whether collocated or dispersed, sets an expectation towards the leaders to have many skills and a number of responsibilities that they need to discharge. They should be able to create a vision for the team, communicate this vision with passion, develop strategies for achieving this vision, build coalitions of believers, attract others behind the vision, and shape the team culture by expressing operating values clearly. All leaders carry out responsibilities which are connected with, for instance, selecting and motivating the right team members, establishing the right norms of behavior, building trust, setting goals, or preparing the teams to anticipate and cope with new situation [Malhotra, Majchrzak, Rosen 2007, p. 61]. Some of these leaders responsibilities are difficult to execute without physical observation of team members. That is why leaders of virtual teams need new skills. In addition, specific features of virtual teams like the fact that they need to rely on electronic communication or actively maintain cross-culture management, create unique leadership challenges. It means that leading virtual teams requires all the leadership skills needed for leading collocated teams plus a few more on top of it. Virtual team leaders should develop competence in areas which will help them to lead their virtual team effectively. The literature [Duarte, Snyder 2006, pp ] names the following competences: performance management and coaching, appropriate use of information technology, managing across cultures, aiding in team members career development and transition, building and maintaining trust, networking, developing and adapting standard team processes. Each of these competences can be consciously worked on and developed. 4 Leading a Virtual Intercultural Team 85 Performance Management and Coaching A virtual team leader is accountable for team members performance and the final output of the team. Virtual team leaders need to be effective in coaching, and what is more, they need to adapt their coaching style to accommodate team members from a different culture. All team members need direction, feedback, and coordination with the leader and other team members. Managing performance is placed on the team and the individual level [Duarte, Snyder 2006, pp. 77]. At the team level, leaders are accountable for completing the task. At individual level, they are accountable for individual members performance. At the beginning of teamwork the leader should explain team s mission, the business problem the team is attempting to solve, and the team s objectives. The role of each individual member should be clearly defined. Appropriate Use of Information Technology What makes it possible to create and to run a team working virtually is modern communication technologies. However, the team leader should be very careful not to treat technology as a means solving all issues but also not as an obstacle in effective teamwork. Technology will not solve communication or productivity issues in the team, but can be of great help when used appropriately. 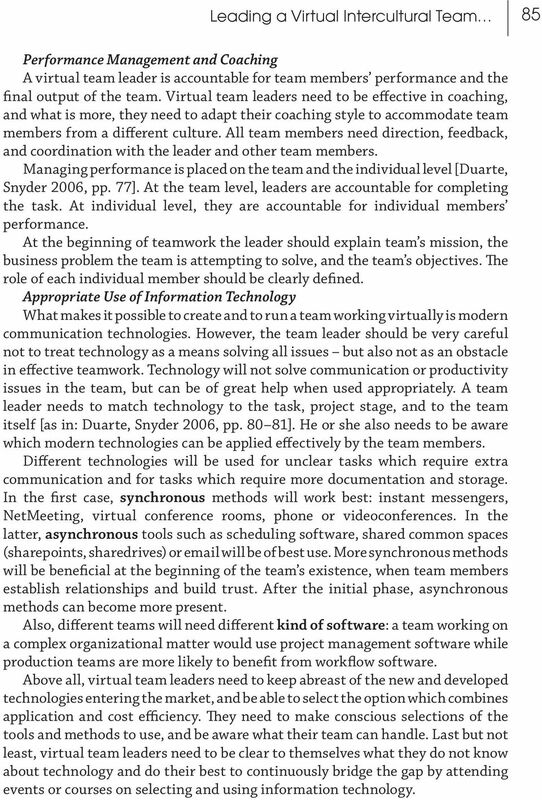 A team leader needs to match technology to the task, project stage, and to the team itself [as in: Duarte, Snyder 2006, pp ]. He or she also needs to be aware which modern technologies can be applied effectively by the team members. Different technologies will be used for unclear tasks which require extra communication and for tasks which require more documentation and storage. In the first case, synchronous methods will work best: instant messengers, NetMeeting, virtual conference rooms, phone or videoconferences. In the latter, asynchronous tools such as scheduling software, shared common spaces (sharepoints, sharedrives) or will be of best use. More synchronous methods will be beneficial at the beginning of the team s existence, when team members establish relationships and build trust. After the initial phase, asynchronous methods can become more present. Also, different teams will need different kind of software: a team working on a complex organizational matter would use project management software while production teams are more likely to benefit from workflow software. Above all, virtual team leaders need to keep abreast of the new and developed technologies entering the market, and be able to select the option which combines application and cost efficiency. They need to make conscious selections of the tools and methods to use, and be aware what their team can handle. Last but not least, virtual team leaders need to be clear to themselves what they do not know about technology and do their best to continuously bridge the gap by attending events or courses on selecting and using information technology. 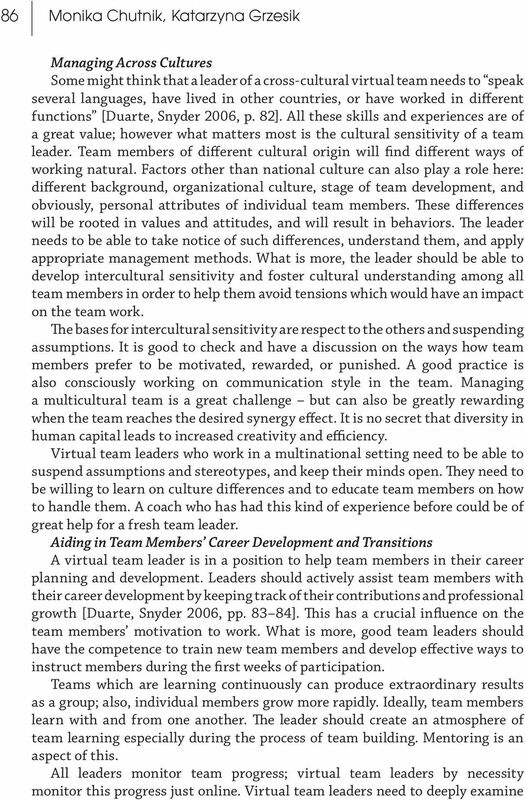 6 Leading a Virtual Intercultural Team 87 synchronous and asynchronous communication patterns to determine who participates in team activities and who needs support or suggestion for further participation [Malhotra, Majchrzak, Rosen 2007, p. 66]. Building and Maintaining Trust As there are more opportunities to judge about other members trustworthiness in a collocated team, it is easier to build and maintain trust in a face-to-face than in a virtual setting. Creating and keeping trust in virtual teams requires much more conscious effort from leaders. Frequently, specialist members join such teams just for a short period of time; in such cases building and maintaining trust is even more challenging. 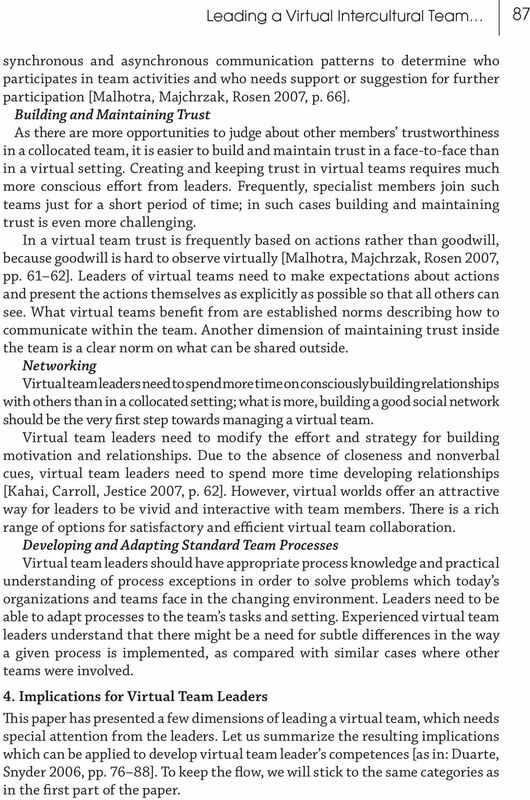 In a virtual team trust is frequently based on actions rather than goodwill, because goodwill is hard to observe virtually [Malhotra, Majchrzak, Rosen 2007, pp ]. Leaders of virtual teams need to make expectations about actions and present the actions themselves as explicitly as possible so that all others can see. What virtual teams benefit from are established norms describing how to communicate within the team. Another dimension of maintaining trust inside the team is a clear norm on what can be shared outside. Networking Virtual team leaders need to spend more time on consciously building relationships with others than in a collocated setting; what is more, building a good social network should be the very first step towards managing a virtual team. Virtual team leaders need to modify the effort and strategy for building motivation and relationships. Due to the absence of closeness and nonverbal cues, virtual team leaders need to spend more time developing relationships [Kahai, Carroll, Jestice 2007, p. 62]. However, virtual worlds offer an attractive way for leaders to be vivid and interactive with team members. There is a rich range of options for satisfactory and efficient virtual team collaboration. Developing and Adapting Standard Team Processes Virtual team leaders should have appropriate process knowledge and practical understanding of process exceptions in order to solve problems which today s organizations and teams face in the changing environment. Leaders need to be able to adapt processes to the team s tasks and setting. Experienced virtual team leaders understand that there might be a need for subtle differences in the way a given process is implemented, as compared with similar cases where other teams were involved. 4. 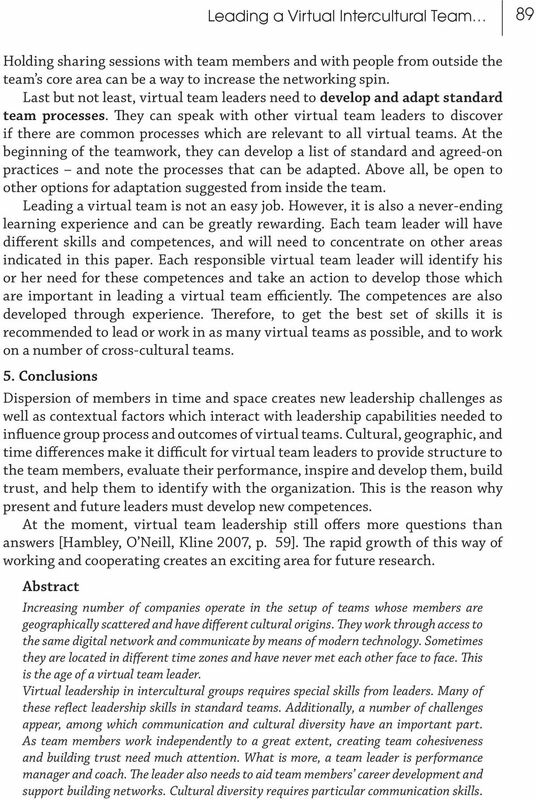 Implications for Virtual Team Leaders This paper has presented a few dimensions of leading a virtual team, which needs special attention from the leaders. Let us summarize the resulting implications which can be applied to develop virtual team leader s competences [as in: Duarte, Snyder 2006, pp ]. To keep the flow, we will stick to the same categories as in the first part of the paper. 7 88 To improve capabilities in the area of performance management and coaching, a team leader could participate in organization-sponsored or external courses on performance management, coaching, project management, selecting and using technology, working cross-culturally, career development. It is recommended to develop a performance plan for the team and despite the considerable investment of time and effort to have a performance, coaching, and feedback plan for each individual team member. To be able to understand clearly what is available and what is not, it would be recommended to meet with a compensation specialist within the organization. A similar plan can be developed for the appropriate use of information technology, where each task can be assigned to a specific tool. As a virtual team is heavily dependent on the modern communication tools, a team leader needs to stay abreast with the development in the field, e.g. by attending technology conferences and demonstrations. Cultural diversity can be a big challenge in a dispersed virtual team. Open communication and no assumptions are the best way to avoid misunderstandings. A good practice to manage across cultures is to ask people openly how they prefer to work, as the accepted style can be very different in different cultures. What surely helps is to increase own knowledge and experience in the intercultural area, by visiting as many countries as possible and observing cultural specifics. What works great is to align with another team leader or mentor who has worked cross-culturally. To aid in team members career development and transitions, team leader can create and use a process for career planning and next-assignment planning for team members. He or she should also hold career development discussions with team members and attend to personal career needs. A practical way to handle these needs is to ask team members about their next-assignment preferences and coordinate this information with others. Building and maintaining trust is a very important human aspect of working together. A leader could develop a visible trust plan for the team, examine the behaviors of a team member one trusts, and note what this person has done to build this trust. As in the other dimensions, it is best to ask team members openly what you as the team leader can do to build trust. Virtual teamwork is based on relationships, and this is the reason why networking is omnipresent. As a leader of a virtual team, one can analyze relationships with important people across different boundaries, note patterns of good and poor relationships and consider what may cause them. More individually, a team leader can examine behaviors of someone one respects as good networker and note what the person has done to be seen this way. Again, the knowledge is rooted in the team they might be able to tell in which areas they believe the team is effectively networked and in which areas it is not. 8 Leading a Virtual Intercultural Team 89 Holding sharing sessions with team members and with people from outside the team s core area can be a way to increase the networking spin. Last but not least, virtual team leaders need to develop and adapt standard team processes. They can speak with other virtual team leaders to discover if there are common processes which are relevant to all virtual teams. At the beginning of the teamwork, they can develop a list of standard and agreed-on practices and note the processes that can be adapted. Above all, be open to other options for adaptation suggested from inside the team. Leading a virtual team is not an easy job. However, it is also a never-ending learning experience and can be greatly rewarding. Each team leader will have different skills and competences, and will need to concentrate on other areas indicated in this paper. Each responsible virtual team leader will identify his or her need for these competences and take an action to develop those which are important in leading a virtual team efficiently. The competences are also developed through experience. Therefore, to get the best set of skills it is recommended to lead or work in as many virtual teams as possible, and to work on a number of cross-cultural teams. 5. Conclusions Dispersion of members in time and space creates new leadership challenges as well as contextual factors which interact with leadership capabilities needed to influence group process and outcomes of virtual teams. Cultural, geographic, and time differences make it difficult for virtual team leaders to provide structure to the team members, evaluate their performance, inspire and develop them, build trust, and help them to identify with the organization. This is the reason why present and future leaders must develop new competences. 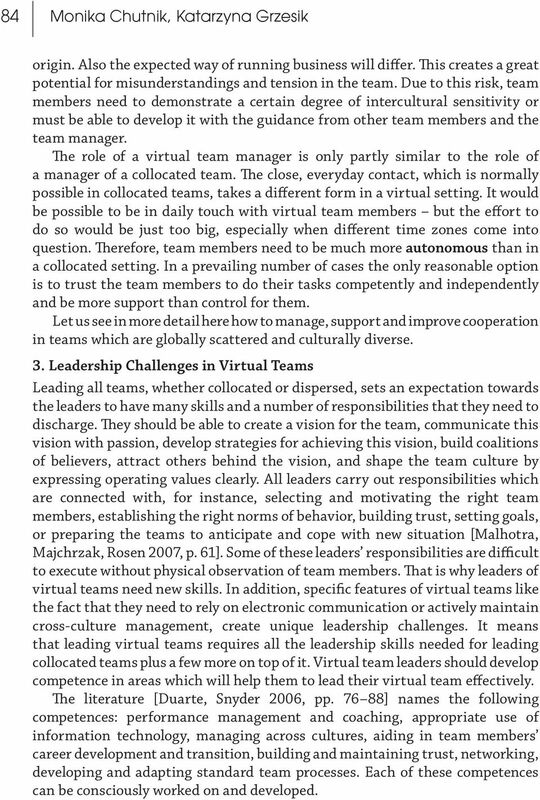 At the moment, virtual team leadership still offers more questions than answers [Hambley, O Neill, Kline 2007, p. 59]. The rapid growth of this way of working and cooperating creates an exciting area for future research. Abstract Increasing number of companies operate in the setup of teams whose members are geographically scattered and have different cultural origins. They work through access to the same digital network and communicate by means of modern technology. Sometimes they are located in different time zones and have never met each other face to face. This is the age of a virtual team leader. Virtual leadership in intercultural groups requires special skills from leaders. Many of these reflect leadership skills in standard teams. Additionally, a number of challenges appear, among which communication and cultural diversity have an important part. As team members work independently to a great extent, creating team cohesiveness and building trust need much attention. What is more, a team leader is performance manager and coach. The leader also needs to aid team members career development and support building networks. Cultural diversity requires particular communication skills. 9 90 The leader must also be able to develop and adapt standard team processes. Finally, technology available needs to be used appropriately to support effectiveness of the team. The paper presents areas of special interest and indicates competences of a leader in a virtual intercultural team. References Duarte, D.L., Snyder, N.T. 2006, Mastering virtual teams: strategies, tools, and techniques that succeed, The Jossey-Bass business & management series, San Francisco. Hambley, L.A., O Neill, T.A., Kline, T.J.B. 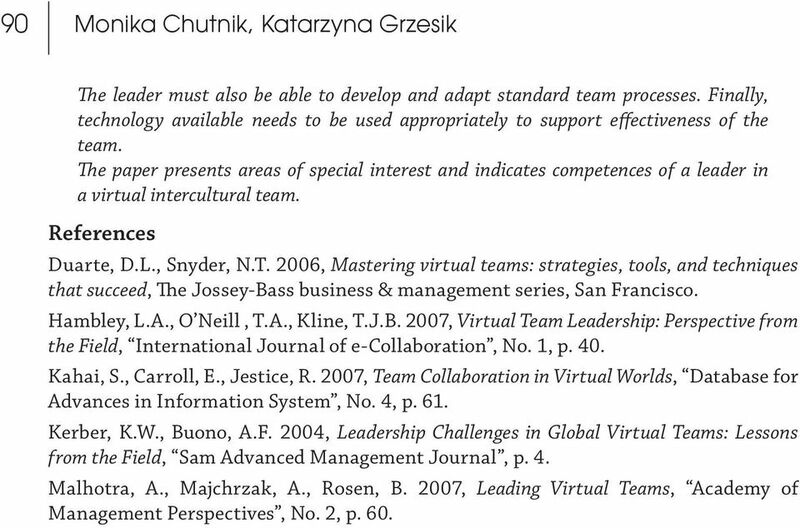 2007, Virtual Team Leadership: Perspective from the Field, International Journal of e-collaboration, No. 1, p. 40. Kahai, S., Carroll, E., Jestice, R. 2007, Team Collaboration in Virtual Worlds, Database for Advances in Information System, No. 4, p. 61. Kerber, K.W., Buono, A.F. 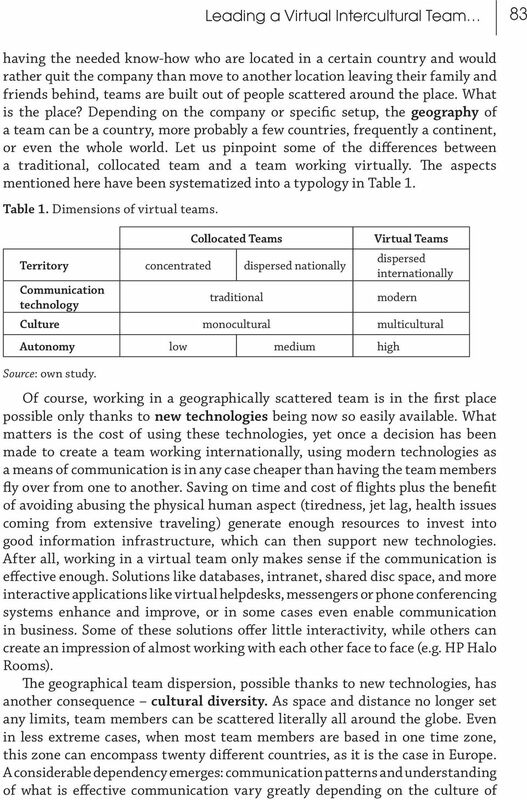 2004, Leadership Challenges in Global Virtual Teams: Lessons from the Field, Sam Advanced Management Journal, p. 4. Malhotra, A., Majchrzak, A., Rosen, B. 2007, Leading Virtual Teams, Academy of Management Perspectives, No. 2, p. 60. Journal of Intercultural Management Vol. 2, No. 1, March 2010, pp. 49 56 Monika Chutnik Uniwersytet Ekonomiczny we Wrocławiu Katarzyna Grzesik Uniwersytet Ekonomiczny we Wrocławiu Performance Through Relationships. Designing, Managing, and Working in Virtual Teams Sandy Staples and Jane Webster Queen s University 1 Agenda 1. What is a team? What makes a team effective? 2. Adding virtualness to a team: what & why? CULTURAL DIFFERENCES IN PROJECT MANAGEMENT Ranf Diana Elena 1 ABSTRACT: In tough economic times and under global competition, management by projects is now regarded as a competitive way for managing organizations.